Although there are more than 800 Japanese restaurants in Singapore, the Japanese expat community is tight and word gets around the grapevine. On separate occasions, Japanese have recommended Sushi Mitsuya along Tras Street. It offers good value for their excellent sushi; it is still expensive, my Japanese friends said, but less expensive than top tier Japanese restaurants in Singapore. For lunch, the barachirashi set ($50) is least worth it to me; it’s only a bowl of rice with diced fish and you can’t gauge the culinary prowress of the Head Chef Ryosuke Harada, who worked at Sushi Sora at Mandarin Oriental Tokyo. The two sushi sets ($60 or $100) are better. 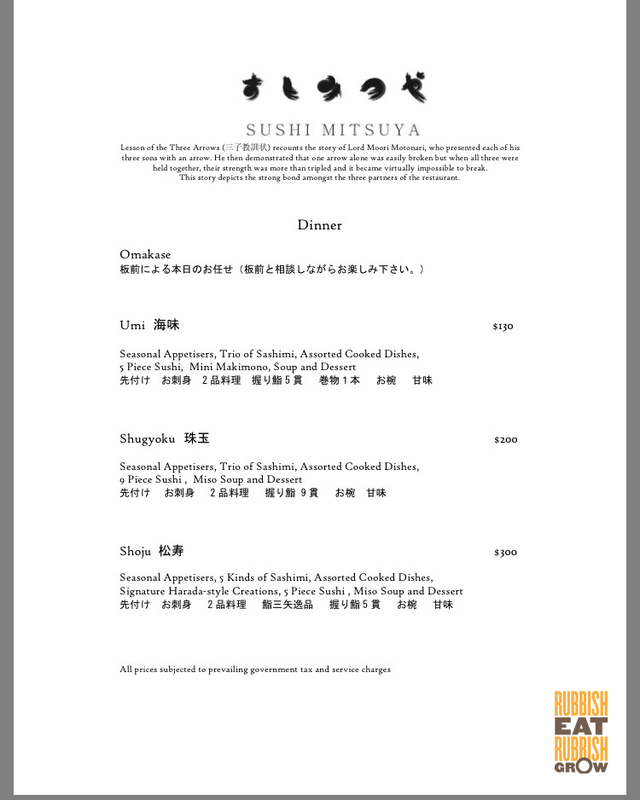 If you can splurge, the lunch omakase set ($180) is more affordable than the dinner ($130 or $200 or $300). The problem with Japanese sushi restaurants in Singapore, in general, is that just for a little bit of better quality, you have to pay a lot more. 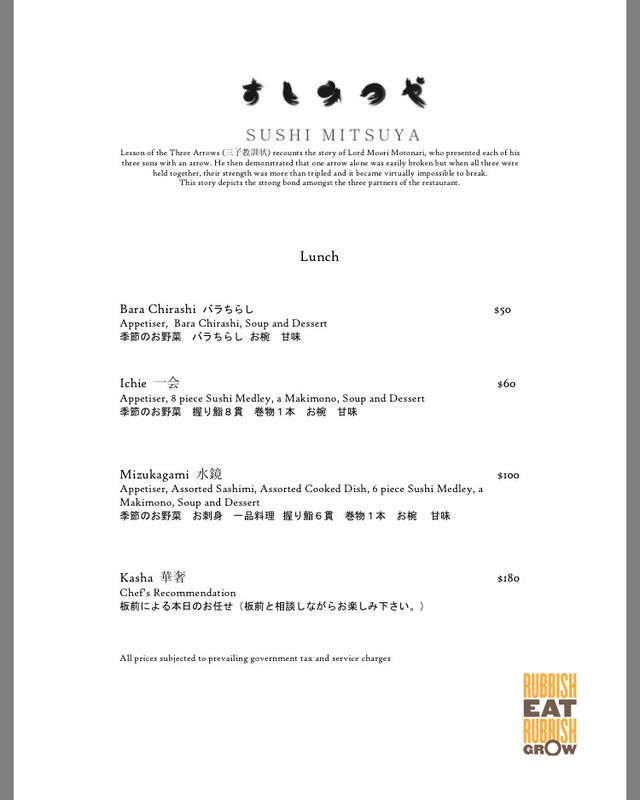 Mitsuya’s two lunch sushi sets, for example, differ by $40; the less expensive set has 8 pieces of sushi whereas the more expensive has 6 pieces of superior ingredients, along with extras such as cooked dishes and sashimi that the less expensive set doesn’t have. I took the more expensive sushi set. The cooked dishes are impressive. It starts with a homemade sesame tofu which has a gooey texture. In the mouth, sweet, salty, pungent flavors explode. How can they make tofu taste so heavenly? Following the tofu, the clams with mustard is sweet from the seafood, and nicely chewy. The steamed cod, however, could do with a little salt, and the homemade prawn ball soup, which comes at the end of the meal, is equally bland. The plating for sashimi is gorgeous, and seeing it already lifts one’s spirit. They are ok in general, but the maguro tuna is tasteless and should have been aged longer and the saba mackerel is fishy. Long anticipated is the sushi and they appeal to the sight. They look like tiny, bite-sized of jewels, shiny and pristine. The firmness of seafood, not soft and slimy, is much appreciated and the shari is slightly harder than other sushi-ya’s, which gives the sushi a good overall bite. Here, I feel that Chef Harada uses salt too liberally. The soy sauce overcomes the taste of kasugodai sushi (baby snapper), which is overly sinewy. The hotate scallop, seasoned with black salt and yuzu, has the same problem of oversaltiness. Less is more. Like the saba in the sashimi, the saba sushi is fishy. Perhaps it would be better not to repeat the fish in both sashimi and sushi. Chutoro medium fatty tuna is divine! The treatment of it, making small slits on the surface, brilliantly increases the surface area, enhancing the availability of fats. It also curls in the mouth, like a cat in a box, giving a feel-good mouthfeel. But how come otoro isn’t offered in this set?! Although the uni sushi is so chilled it gives my tooth an ache, it is amazing. That seafood-sweetness-crossed-peanut-butter-creaminess. OMG. I also want to write an ode to the top quality seaweed. It’s crisp and umami, going excellently with the uni. I also like the arrangement of the sushi, from lightest to heaviness, ending with a spectacular anago sea eel. I have no particular liking for anago, but Chef Harada makes it such that it is pillowy with the right balance of sweetness and saltiness that I understand why he puts it at the end of the array as a highlight. Negitoro maki is a commonplace sushi, but like the anago, Chef Harada has elevated it, making it umami and unforgettable with that crisp and delicious seaweed. Usually Japanese restaurants don’t pay attention to their desserts. It isn’t part of the traditional omakase culture to have desserts; usually it’s just fruits or ice cream. But Mitsuya gives a well-rounded experience by their miso ice cream paired with hojicha (roasted tea) panna cotta. It’s one of the most original and delicious desserts I’ve eaten this year: salty miso counterbalances the sweet panna cotta. Moreish! I can see why many of my Japanese friends recommend Mitsuya. Compared to top sushi restaurants, the quality is on par, and the price is better. I paid $117 for my meal. Mrs Pho House, Rangoon Road: Vietnamese Seafood Cze Char, One of the Best Casual Restaurants This Year!